This is one of a series of ‘hints and tips’ articles from Ruth O’Leary. View some of Ruth’s work in the Gallery. 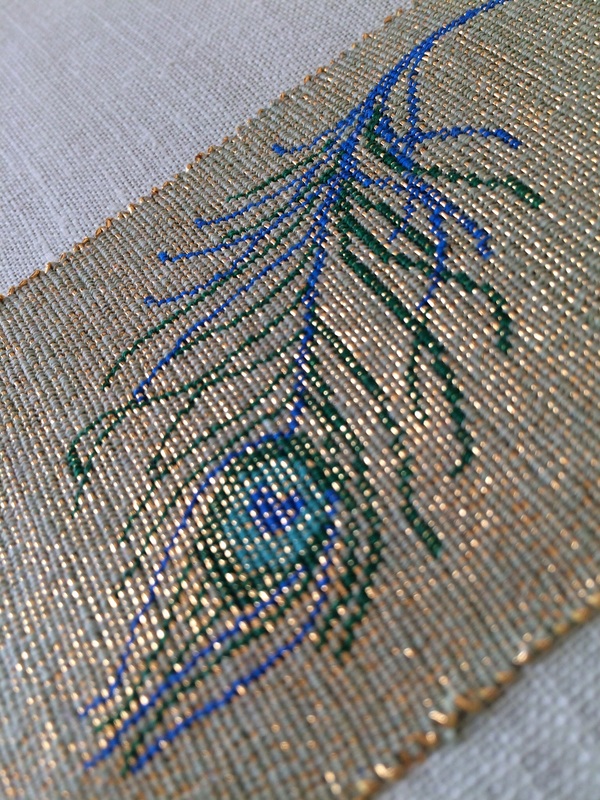 While stunning effects can be obtained using basic goldwork couching techniques, you can take this further with the introduction of colour to your metal thread work, giving effects such as the “scales” in Dragon. 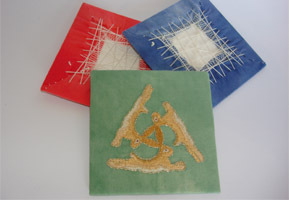 Embroidery thread for couching, in the shade or shades of your design. 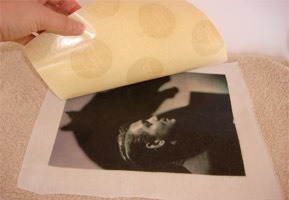 Transfer the design to your background fabric and mount the fabric in a frame or hoop, using a backing fabric if required. Lay the metal thread on top of the design, starting at the edge. Leave an end of about 1 inch (2.5cm) for finishing off later. 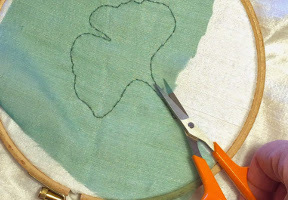 Using the embroidery thread in a complementary colour, make a small straight stitch over the metal thread, attaching it to the background fabric. 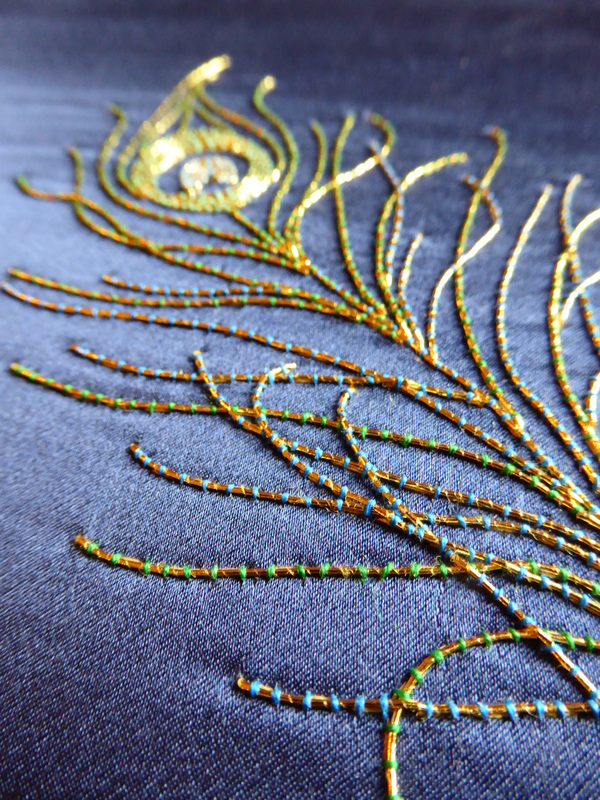 Couching with colour is very close to basic goldwork, but with a coloured couching thread rather than one matching the metal thread. It’s also common for the couching stitches to be closer together than for basic couching; this gives a stronger coloured effect – for a lighter effect, space the couching stitches out further, or vary the spacing to give more solid colours in some areas. By using more than one colour, you can add contrast and build up your design. 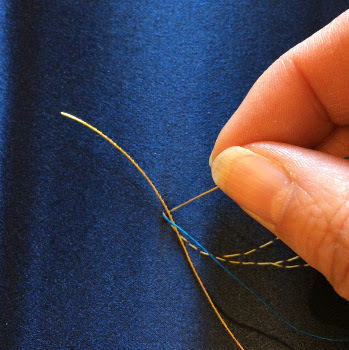 If required, you can use more than one colour when couching the same metal thread. 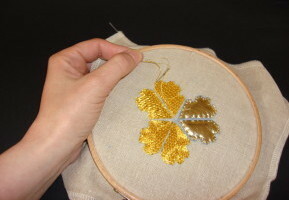 While couching with colour tends to be worked in a similar manner to basic goldwork in that only a portion of the overall design is worked, often over a felt shape, or nué (“shaded gold”) covers the entire background fabric. 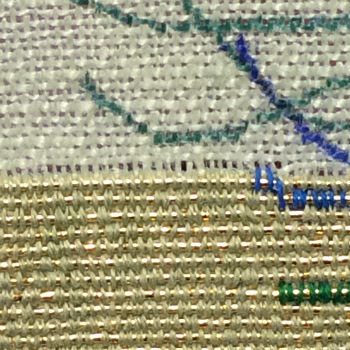 The couching stitches are worked very closely together, so that the overall effect isn’t gold with a hint of colour, as in couching with colour, but colour with a hint of gold. 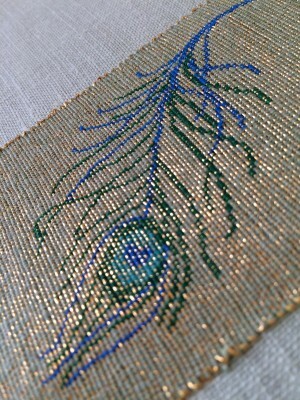 Minute gaps between the stitches allow the gold to sparkle through, giving a spectacular, rich effect. 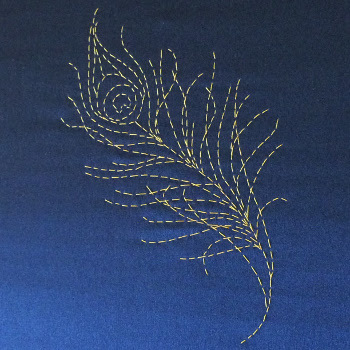 At its finest, or nué is very time-consuming; one gold (or other metal) thread is couched down at a time, and one strand of embroidery cotton or silk is used as the couching thread. 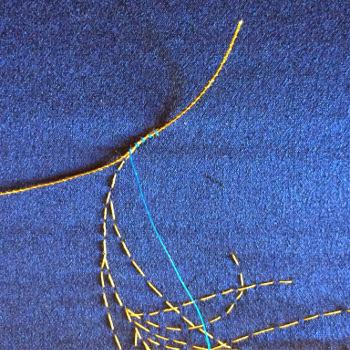 Each couching stitch is tiny and they’re quite closely packed, so it requires a great deal of patience to complete a piece of any size. 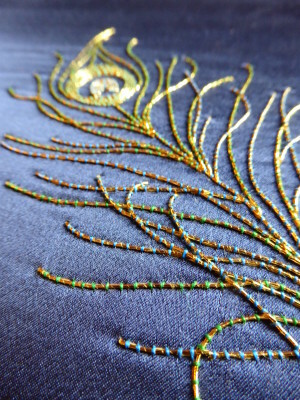 If a less detailed effect is acceptable, for example on a large-scale piece, two metal threads and two strands of embroidery thread can be used. Combining basic couching with or nué in a part of the design can also be very effective – the coloured area stands out against a shimmering gold or silver background. 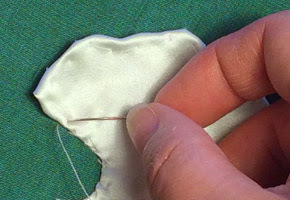 However, remember that the densely-packed stitches can push the couched metal threads apart slightly, an effect that’s magnified the more couched rows you work. To minimise this, work the or nué section in one strand of a fine embroidery thread such as silk or rayon rather than the thicker cotton.